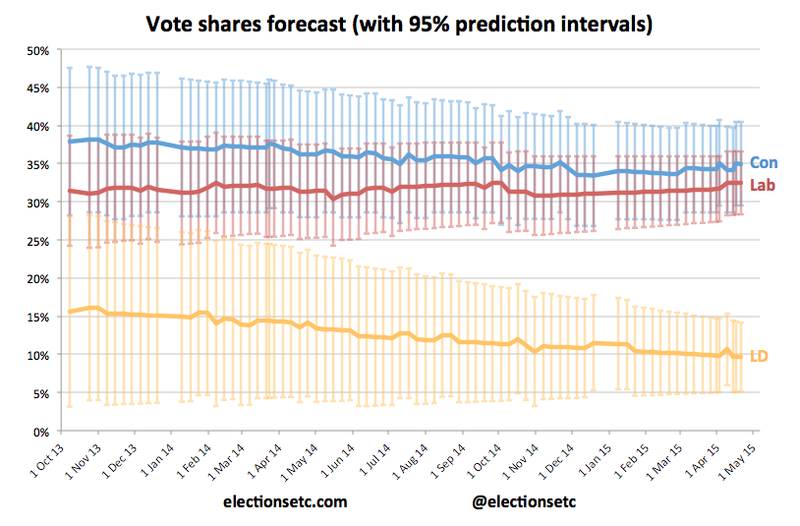 No change in the polling average shares since Friday, so practically no change in the overall forecast shares. 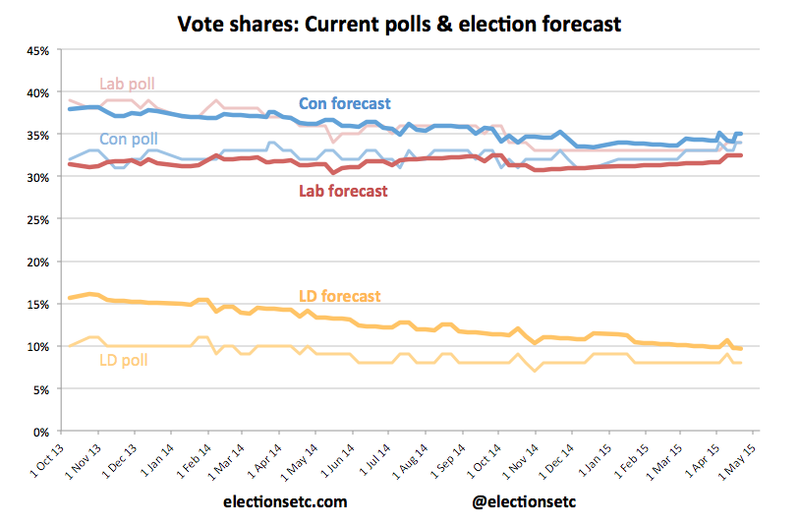 However, recent YouGov data suggests Labour doing a bit better than previously calculated in key Con-Lab marginals. Also the estimate for how well the Liberal Democrat MPs are doing where they are defending has gone up a little. 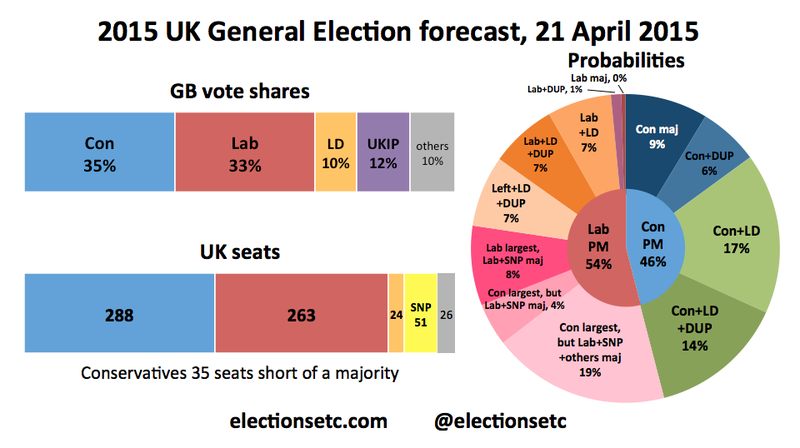 As a result of these adjustments the forecast number of seats for both Labour and the Lib Dems has gone up a little and the Tories have correspondingly come down. Overall though the adjustments I make for constituency level variation within England and Wales on the basis of Ashcroft and kindly provided YouGov data are still good for the Tories and bad for Labour relative to uniform change. Most notably both data sets suggest that Conservative MPs who defeated a Labour MP in 2010 are doing a couple of points better than other Tory candidates. This seems to be an instance of the classic “sophomore surge” which is common in the US and which also seemed to have helped many first-term Labour MPs hold on in 2001 despite a swing to the Conservatives. Previous PostArguments and prospects for tactical votingNext PostWhich way would the Lib Dems go? I’m of the opinion that double standards like this will be noticed by the voters. Certainly this SNP story could run and run. And can it really help Labour?? How on earth is that a double standard? Should the SNP be compelled to vote for a Tory queen’s speech, or be compelled to pretend that they would? Surely it’s their choice, and it’s far better that they make that choice clear before the election than keep it a secret. Major’s notion that Scottish MP’s should be seen but not heard due to them only making up a small percentage of the electorate, IS an affront to democracy. and of course peter you don’t have double standards do you? remember Cameron demanding a debate with brown 5 years ago then changing his mind now hes the pm? No, incumbents don’t ever seem to like debating the opposition. That’s nothing new. I seem to remember Tony Blair avoided this sort of debate. And it did him no harm – as he was a three-time election winner. The point I was making about the SNP (Sturgeon in particular) and also Labour for that matter, is that they cry ‘foul’ and say ‘..oooh, that’s negative campaigning…’ when the Tories seek to warn of the dangers of a Labour minority government in hock to the SNP. On the other hand Ms Sturgeon feels she can talk about ‘locking Cameron out of Downing St’ (and make all sorts of other aggressive statements) with impunity. That’s what I mean about double standards. The left have even hijacked certain words and used them for their own purposes. In recent TV debates, I have squirmed while watching the SNP the Greens and Plaid Cymru describing their own parties as ‘progressive.’ These 3 parties have policies which are sadly similar, but they are not ‘progressive’ parties, and Nicola Sturgeon has nothing new to offer. They are just the same old-fashioned tax, borrow and spend parties. Happy to take on too much debt, tax society more heavily, abandon our nuclear weapons and leave our children vulnerable. Nothing progressive about that. Balancing the books is not ‘austerity,’ and achieving a balanced budget by trimming spending is something that every family has to do. It’s not a task that is relished by governments – I am sure – but there have to be cutbacks at times when spending has spiralled out of control. My other point is that so many parties of the left promise to spend (and spend) without sufficient regard to where the cash is coming from. Syriza and Greece is a basket case. If these parties make it into government they then have to adapt to economic reality……..And when they leave office, as Liam Byrne pointed out, they invariably leave the coffers empty! I feel that the electorate, or what used to be called the ‘silent majority,’ will have spotted this and the LibDems and Conservatives will fare much better in May than the current opinion polls suggest. But then only time will tell.